Very complex and intricate design goes completely around this one pint tankard and even the handle is has a cast knotwork design. Tankard is about 5″ tall and measures about 4″ across the base. 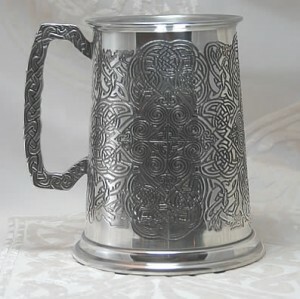 The design is cast so deep that it is visible on the inside as well as the outside of the tankard. This is the tankard to turn heads at the faire…I’ve seen it myself in action.